Over 97% of all email is spam. Spam can be harmless but annoying, it can contain viruses or it can try and trick someone into giving up personal details which in turn leads to identity fraud. 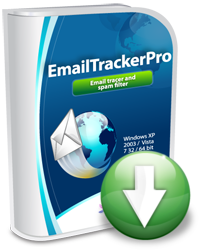 EmailTrackerPro not only offers the ability to trace an email using the email header but it also comes with a spam filter (advanced edition), which scans each email as it arrives and warns the user if it's suspected spam. Essentially stopping spam email before it reaches its intended recipient. Download eMailTrackerPro. 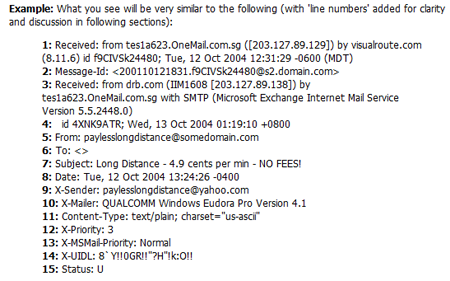 An email 'header' contains all the information required to track where it came from. It holds the footprint of each server the email travelled through which in almost all cases leads us back to the city/town the email originated. Whois information is essentially contact details for the organization that registered/is responsible for the IP address or website being traced. Also uncovered are any services running on the destination machine. The most valuable feature is the ability to trace more than one IP address or domain name at a time. Trace as many IP addresses and domain names as required and either output the results to a new tab or an Excel/HTML file. To make the best use of eMailTrackerPro it's important to trace the email header, and not the email address. An email address, such as anyone@hotmail.com will just run a trace on hotmail.com, and every single time you'll get the same result. 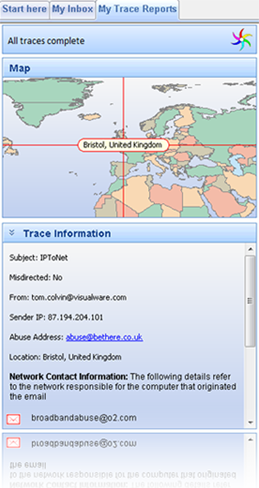 An email header is a virtual footprint telling the user where an email has travelled. Each step along the way is recorded. 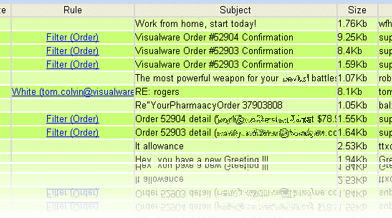 Spammers often try and remove/add lines to confuse where it was sent from. eMailTrackerPro can pick up on patterns and inconsistencies and mark the email as suspected spam, this isn't an exact science so anomalies can occur. An example header can be seen on the right, split up into separate lines for understanding purposes. Click here for tutorials on how to get the email headers for an email. It varies depending on which email program is being used. 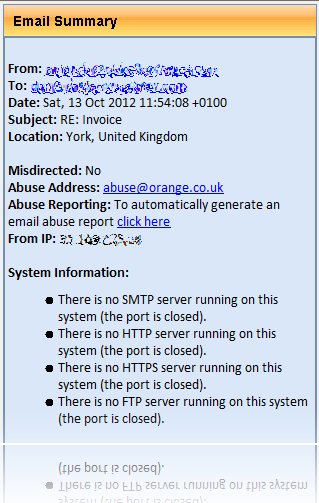 Abuse reporting is a useful feature for users that want to take a more proactive approach to dealing with spam. Email providers, such as Hotmail and Yahoo, have whole departments set up to deal with the spam problem, but they need our help! Once the abuse report has been sent to the email provider it is then up to them to take the next steps to shut the account down. Each account that gets shut down is one more step closer to stopping spam in the long run! So don't delay, start using eMailTrackerPro now and start putting a stop to spam. Always worry about what spam emails may contain? Concerned about your personal data being mined by viruses and trojans. Worry no more, utilize the spam filter feature of eMailTrackerPro and stop spam before it reaches your inbox. 5. All those emails will be deleted. Now when the email application (Outlook, Windows Live Mail) contacts the email server it will only download valid emails! Risk free and no obligation to buy. Simply download, install and enjoy a free, unrestricted 15 day trial. 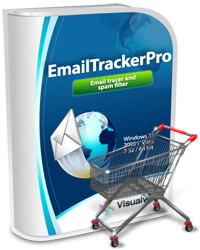 With prices starting at just $29.95 eMailTrackerPro is exceptional value. The Advanced edition is just $20 more at $49.95!